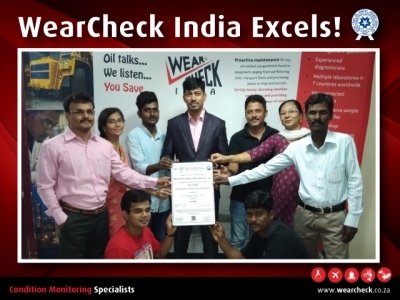 Hearty congratulations to WearCheck India on achieving their ISO 17025 accreditation for the oil lab. National manager for WearCheck India, Nissar Ahamed, is proud of his team for ensuring that all the stringent requirements were met in order to be awarded the certificate. In India, the NABL (National Accreditation Board for Laboratories) is the body that awards the accreditation. Their certificate confirms that WearCheck Laboratories India has been assessed and accredited in accordance with the standard ISO/IEC 17025, and has met the “general requirements for the competence of testing and calibration laboratories”. Team effort! Proudly holding aloft WearCheck India’s newly-awarded ISO 17025 accreditation certificate are staff members (from left): Mohamed, Muji Zaki, Dastigeer, (centre) Nissar Ahamed – national manager: WearCheck India, Mohammad Hussain, Sajida, Balaji. Seated: Jameel Basha and Sai Ganesh.